The G20 meeting in Moscow on food security and social protection brought together major international donor institutions and governments from the G20 richest nations as well as some developing countries. As the only civil society organisation at the event, the Anglican Alliance was asked to make a presentation on the work of the Church in supporting food security in Africa, and later made recommendations to strengthen the commitments to improve food security and also recognise the role of civil society organisations in reaching out to the community, especially to women. Food security is the focus for the Anglican Alliance’s G20 advocacy, especially at next year’s G20 meeting in Australia. In her presentation Sally Keeble cited the work of Anglicans in DRC, in providing support, including food, for children affected by conflict, and in Malawi in providing infrastructure support, especially improved water supplies for smallholder farmers. She held up the work in Mbeere Diocese, of providing access to information about weather conditions and market prices by mobile phones to smallholder farmers to guide them in their planting and harvesting decisions, and also praised the work the diocese is doing to strengthen crop varieties by improving cassava plants for local farmers. Access to finance also received attention in her presentation with a description of the micro-finance support for smallholder farmers, both through very local savings and loans schemes, through the Anglican micro-finance institution Five Talents, and through community banks. The meeting heard from international institutions including the World Bank, World Food Programme, Food and Agriculture Organisation, from the European Union and G20 governments including Japan and South Africa, and from non G20 governments including Tanzania and Nigeria. The report from the event was being taken forward to help shape the G20 development agenda. The presentation at Moscow was the result of careful work by the Anglican Alliance to fulfil the mandate from the founding Nairobi consultation in April 2011 when delegates from across Africa and the rest of the Communion identified the G20 as the key global forum for Anglican advocacy, and food security and economic empowerment as the key issues. Since then the Alliance gained accreditation at the Mexico G20 in 2012, and as a participant at the Moscow Civil Summit of the G20 in June 2013, providing input to the communique that went to the Leaders Summit. The Alliance has already started working, with Anglicans in Australia, on preparations for the 2014 G20 Summit in Brisbane, when it will be seeking to provide a platform for Anglicans in the Pacific whose island homes and food security are threatened by rising sea levels, requiring the smallholder farmers to find different crop varieties that are more suited to the changing climatatic conditions. 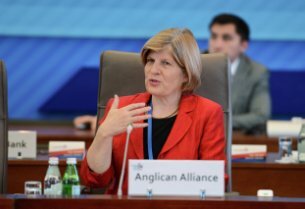 In the picture: The Anglican Alliance – a place at the G20 table.